At S & H Pools, we have a variety of cover lifters for your hot tub. When you have a hot tub at your property in the Hickory, North Carolina area, it’s important to keep it covered when it’s not in use. Keeping a cover on the tub helps maintain the temperature of the water without allowing too much heat to escape as the air evaporates. However, if you have a standard cover on your hot tub, it’s not always easy to maneuver it. The shape and placement of a hot tub can make it difficult to slide the cover on and off. Most covers weigh at least 20 pounds, with some weighing in closer to 50 pounds or more. The weight and awkward shape make it hard to remove a hot tub cover, especially if you’re alone. Twisting and lifting heavy weights can increase the risk of injury, especially to your back. If your hot tub cover is hard to use, you’re probably not going to put it on after you’re done using the tub. Simplify the task by adding hot tub cover lifters to your tub. These helpful accessories are designed to provide an easier way to lift your cover and move it out of the way, so you can use the tub. When you’re finished with your soak, it’s much easier to pull the cover into place and protect the water when you have hot tub cover lifters. 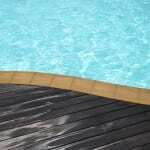 At S & H Pools, we have a variety of hot tub cover lifters. You can choose a set of lifters that will work with your existing cover or opt for a cover that already has the lifters attached. Check out our selection to find the right accessories.